The kitchen is at the heart of every home and the room in which you spend most of your time. When your kitchen is designed exactly the way you want it based on your ideas, it becomes a much more pleasant room to be in. So, why not have the kitchen you envision become a reality? Upgrading your kitchen can update its appearance, improve its purpose, and give it the space you need to make it more comfortable to work in. Since the kitchen is the room that sees the most traffic, you want to feel as comfortable and relaxed as possible. Adding your own style and personality may be just the thing to make your kitchen your dream kitchen. In the past, the work triangle was the design homeowners looked for…was the stove, sink, and refrigerator within the proper distance from each other. Nowadays most homeowners prefer the open layout kitchen design with kitchen islands, extra storage space, and functionality. The size of the kitchen has to accommodate the size of the family. A new and improved well-designed kitchen can give you years of satisfaction and add value to your home. 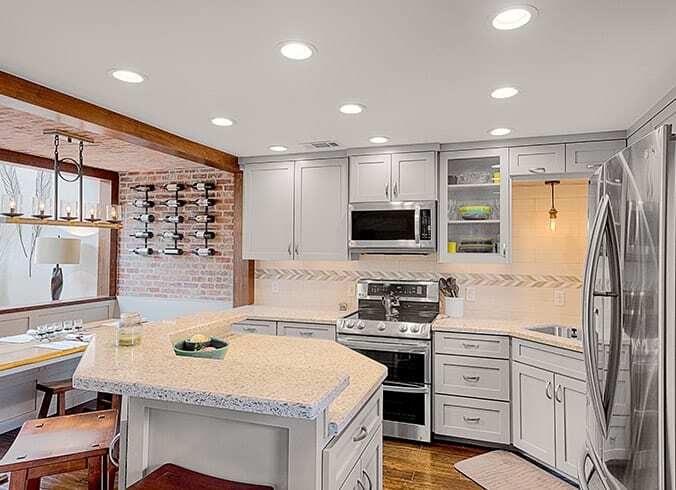 Whether it’s a major renovation or cosmetic changes like new countertops, cabinet fronts, appliances, light fixtures and hardware, a new kitchen can yield more than a 70% return on your investment when you sell. In addition, a newly remodeled kitchen attracts homebuyers. It’s usually the first room they look at when they enter, and the last one they look at before they leave. If you’re planning on staying in your home, you should know that a kitchen remodel is a great starting point to remodel your entire home. Once you remodel the most visited room in the home, you will have a sense of how the rest of the house is going to go. And of course, there is not a one-size-fits-all when it comes to kitchen remodeling. With various styles, designs, colors, sizes, and models…the possibilities are endless! Are you worried about the cost of a kitchen remodel? You can change the entire appearance of your kitchen by simply repainting walls, upgrading cabinets, adding updated countertops, and installing new flooring. And it’s this visual update that can make your kitchen even more appealing. Follow the latest trends and use your home’s design to remodel your kitchen to match your personality and style. Remodeling your kitchen is not just for aesthetic purposes. Changing countertops and cabinets can actually increase the amount of work space you have. Upgrading your kitchen appliances will make your kitchen safer and more energy efficient. Even replacing traditional light fixtures with newer, more modern LED lights can reduce energy costs. If you prefer more natural lighting, adding new windows, additional windows or even a skylight will reduce the need for artificial lighting, thereby saving on energy costs. A kitchen that is environmentally friendly will not only save you money, but it will reduce your home’s carbon footprint. Kitchen remodeling gives extra storage space, more functionality and easier access to allow more room for cleaning, cooking and enjoying meals with friends and family. Adding more cabinets, upgrading your existing cabinets, or changing the layout of the cabinets can create more storage space, greatly reducing the amount of clutter. You can even go so far as to knock down a wall to add more counter space. Your small kitchen has now become your larger dream kitchen. Beginning a kitchen remodeling project can be challenging and overpowering when it comes to design, alterations, and choices. All Star Construction understands how overwhelming undertaking such a project can be. 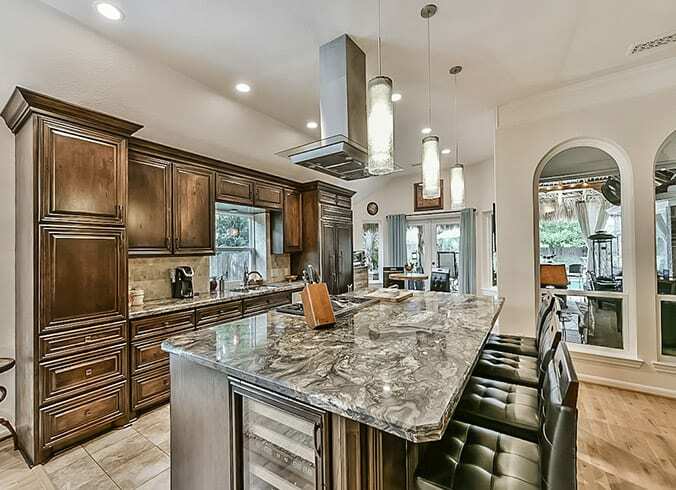 Our kitchen remodeling team in Houston, TX will walk you through every aspect of the process from start to finish, providing you with inventive and creative ideas and solid recommendations based on almost 40 years of experience in the industry. We are your “go-to” designer, creator, builder, and contractor for your kitchen remodel in Houston. We only work with the finest construction materials and offer an unlimited selection of the highest quality kitchen products. Adding an Island or Eating Space – Redesigning a kitchen that uses its space as efficiently as possible and making sure that it fits the needs of your family is one of the most important considerations when remodeling. If you have an open kitchen, adding a kitchen island can give you an additional space to cook, additional storage, and even a place to add a small fridge. Updating Countertops and Backsplashes – One of the easiest ways to change the appearance of your kitchen is with custom countertops. While they may not seem that important, countertops are a major focal point of any kitchen, and they help to increase the value of your home. Not only are countertops one of the first things you see when you walk into a kitchen, but the style and type of material used can maximize your home’s value. One of the reasons to add a backsplash is to protect against water. Water can splash and get into the walls, causing mold and mildew behind the sink. Next backsplashes are used to hide the gaps in your walls from installing countertops. Lastly, backsplashes are eye-catching and beautiful. Designing Cabinets and Drawer Placement – Finding the perfect cabinet design can be overwhelming. There are so many cabinet doors to choose from…construction types, materials, and design styles give you a plethora of choices. Kitchen drawer and kitchen cabinet organization are important aspects when remodeling a kitchen for storage and easy access. Installing New Flooring – There are many benefits to installing new flooring. It can help reduce allergens, help you stay warm by providing insulation, and can improve the quality of your home by adding just the right amount and shade of color.